The most important issue among 2010 Oregon Republican Primary Voters , by a wide margin, is the economy followed by the deficit. However, there are significant differences among demographic groups below the surface. The top issues of 2010 Oregon Republican Primary Voters are largely determined by income. The economy is by far the top issue among all group, higher, middle, and lower incomes. Middle incomes, $30,000 to $75,000, are the most concerned with the economy among all groups and overwhelmingly above the next issue. Higher income, $75,000 plus, place the deficit a closer second. Education also breaks into the double digits. Lower income, $30,000 and under, place a set of issues, health care, the deficit, the Afghan War, and social issues, all at about the same level. The survey consisted of 400 live telephone interviews of likely 2010 Oregon Republican Primary voters completed each of April 26-28, 2010 and May 10-12, 2010.The margin of error at the sample median for each survey was 5 percent. 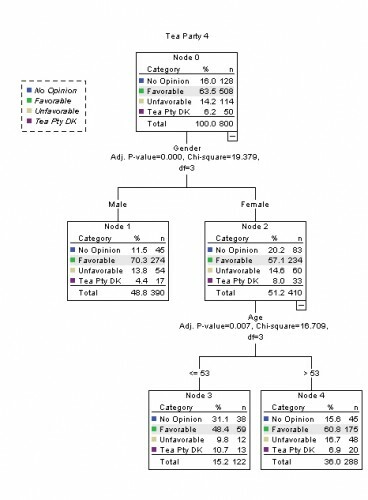 Likelihood based on a turnout model that includes vote history, gender, age, and region. The Tree diagram was constructed using CHAID (Chi-Squared Automatic Interaction Detection). 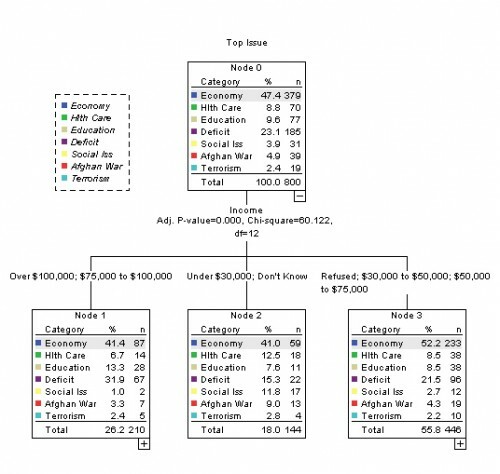 It is a method used to explore crosstabulated data. Among likely Republican Primary voters, there are three clear segments that distinguish favorability towards the Tea Party movement based on gender and age. Men are the most favorable towards the Tea Party movement at 70 percent. Older women, 54 and older, are the next most favorable at 60 percent. Younger women, 53 and younger, are the least favorable at 48 percent. Familiarity with the Tea party movement appears correlated with favorability at least among Oregon Republican Primary voters. Younger women are the least familiar and men are the most familiar. Movement? IF FAVORABLE OR UNFAVORABLE: Is that strongly or somewhat? To no one’s surprise, I’m sure, District 7 (Madison Nguyen) has the highest percentage of Vietnamese voters. District 4 (Kansen Chu) and District 8 (Rose Herrera) come next. The southwest and west of San Jose (Districts 1, 6, 9, and 10) have the lowest percentages. Source of data: Labels of Lists of Bellevue, Washington. 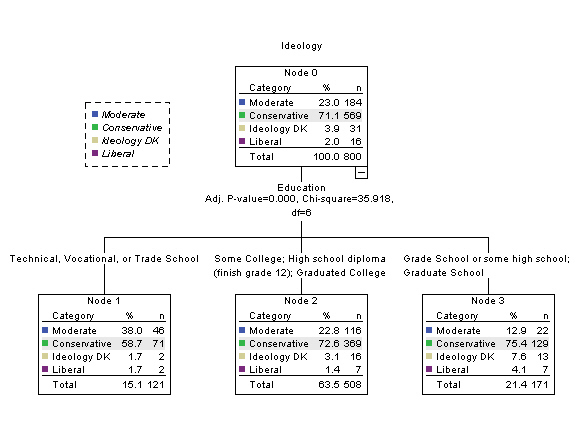 Among 2010 Oregon Republican Primary voters, where one placed oneself on the ideological spectrum, conservative, moderate, or liberal, was primarily determined by education. Those with a two-year college education were much more likely to be moderate. 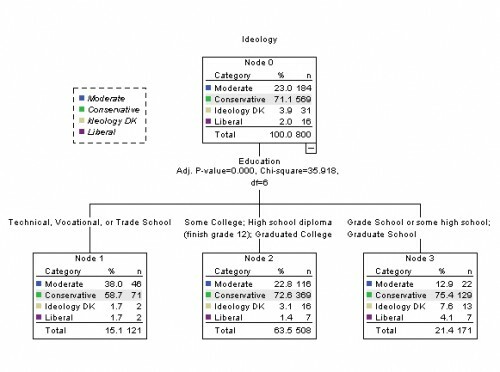 Those at either end of the spectrum, grade school or graduate school, were more likely to be at one or the other end of the ideological spectrum: conservative or liberal. Now, do you consider yourself a conservative, a moderate, or a liberal [ROTATE]? Now, here is some post-primary trivia. See http://lindholmcompanyblog.com/?p=3017 for some pre-primary trivia. If Chris Dudley is elected Oregon’s Governor, he would be the first person elected Governor who had never held prior elective office since Charles Sprague’s election in 1938 – 72 years ago! Sprague was the Editor of the Salem Statesman-Journal at the time of his election. The same point would have also held for Allen Alley, had he become the Republican nominee. Only John Lim, among the four major Republican candidates in the Primary, had held an elective office previously. Before Sprague’s feat and since 1900, two attorneys, Oswald West in 1910 and Julius Meier in 1930, were elected without prior elective experience. However, both had shared law offices with prominent politicians and were their designated successors. Experience has been important to voters outside of Oregon as well. Even in the somewhat wilder politics of California, few governors has been elected without previous statewide elective experience. There have only been two exceptions: Ronald Reagan and Arnold Schwarzenegger. (http://www.mercurynews.com/bay-area-news/ci_15050933) Both ran as anti-establishment outsiders. That piece of trivia, does bode well for Dudley. The surveys each consisted of 400 live telephone interviews of Santa Clara County likely June 2010 Primary voters conducted June 16-18, 2009, October 26-28, 2009, February 15-17, 2010, and May 10-12, 2010. The margin of error at the sample median is 5 percent. Quotas and/or weights were established by gender, age, party, region, and vote history as part of the turnout model. As we wait for the election results tonight, here are a couple bits of trivia to tide you over. They all follow the theme that Portland is not really the center of Oregon’s political talent universe. First, the Democrats … tonight’s results, regardless of whether Bill Bradbury or John Kitzhaber becomes the Democratic nominee for Governor, will mean the fifth straight time a Democrat nominated for Governor served his state legislative or local office in Eugene or its region (TV DMA or Congressional District, take your pick). Second, on the Republican side, there is a point the emphasizes futility. Portland Republicans have not been successful recently … taking the term “recently” to mean nearly a generation! (1) The series of Democratic nominees for Governor consists of: Ted Kulongoski: 1982, 2002, and 2006; Kitzhaber: 1994 and 1998; Roberts: 1990; Goldschmidt: 1986; Bob Straub: 1966, 1970, 1974, and 1978. Straub was a Lane County Commissioner first elected in 1954. Of course, Kitzhaber is another South Eugene High School grad and Bradbury worked at Eugene’s KVAL. (2) The last time a non-incumbent Oregon Republican from Portland won a statewide contest was 1978 (Vic Atiyeh for Governor). Republicans who have won as challengers or won open seats since 1978 are: Dave Frohnmayer in 1980; Jack Roberts in 1994; and Gordon Smith in 1996 (with re-election in 2002). Frohnmayer and Roberts are both from Eugene. Smith is from Pendleton. (3) Regarding trivia, no Democratic challenger won statewide office from 1966 to 2006. That long Democratic drought didn’t make Gordon Smith invulnerable in 2008. Trivia, often, is trivial. The latest survey on the Senate contest shows Jim Huffman leading by a significant amount. However, just like the Gubernatorial Primary, There is a large undecided. If the Republican Primary election for Senate were held today, would you vote for: Tom Stutzman, Robin S. Parker, Loren Later, G. Shane Dinkel, Jim Huffman, Walter H. Woodland, or Keith Waldron? The survey consisted of 400 live telephone interviews of likely 2010 Oregon Republican Primary voters completed April 26-28, 2010.The margin of error at the sample median was 5 percent. 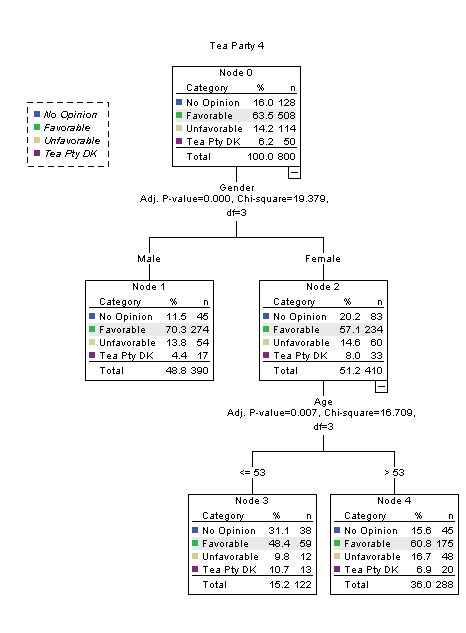 Likelihood based on a turnout model that includes vote history, gender, age, and region. Alley’s advantage over Dudley consists entirely among high propensity Republican Primary voters. Alley and Dudley are tied among lower propensity voters. Lower propensity voters are also significantly more likely to be undecided. This analysis is a shift from the previous two tracking polls. On March 1-3, Dudley had an advantage among men. On April 26-28, Alley and Dudley were equal across demographics. On May 10-12, a significant division has developed based on voter propensity. The survey consisted of 400 live telephone interviews of likely 2010 Oregon Republican Primary voters completed May 10-12, 2010.The margin of error at the sample median was 5 percent. Likelihood based on a turnout model that includes vote history, gender, age, and region. Alley and Dudley are in a statistical tie: less the half the margin of error (5%) separates them. Alley’s support has increased dramatically the past two weeks while Dudley’s has not moved. Lower turnout should benefit Alley. Higher turnout should benefit Dudley. The percentage of undecided, 29%, is very high and implies the final result is unknown. Large movements in the final days have happened before in the Oregon Republican Gubernatorial Primary. In 2002, Ron Saxton went from first in the polls to finish in third place in the final few days. Earlier surveys were conducted March 1-3, 2010 and April 26-28, 2010. The results from the April 26-28, 2010 survey are posted at: http://lindholmcompanyblog.com/?p=3029. The results from the March 1-3, 2010 survey are posted at: http://lindholmcompanyblog.com/?p=2837.